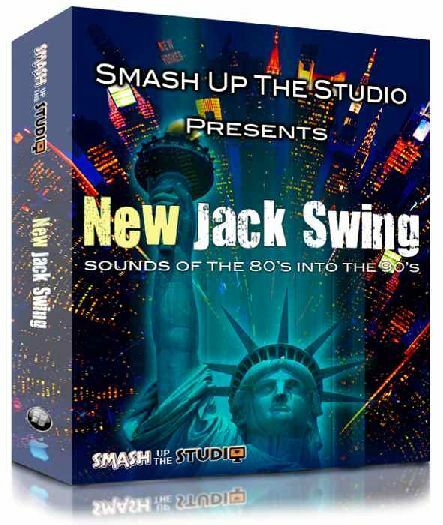 A sizzling selection of loops and samples in classic Swingbeat style from Smash Up The Studio. Sweet keyboard loops, funked up basses and big beats adorn this great new collection that has been broken out into 8 construction kits ready to arrange and mix. Sweet keyboard loops, funked up basses and big beats adorn this great new collection that has been broken out into 8 construction kits ready for you to arrange and mix. "Sweet melodies and big beats" is probably the best way to describe "New Jack Swing" a fusion of swinging Hip Hop beats and smooth RnB style keyboards and vocals from the late 80's into the mid 90's. This pack contains 8 construction kits, each made up of keyboard loops, drum samples and hits, and they include all the sounds and beats you hear in the preview tracks. All you have to do is arrange them to your own personal requirements and mix. Each kit comes labelled with key and tempo info. All of the sounds have been recorded in 24 bit audio and have been treated with some fat EQ and compression by our engineers, but most have been left dry so you can add your own reverbs, delays etc. Also some of the keyboard loops have deliberately not been snipped at the end of the bar so as to let the natural ambience and decay of the sound end naturally. Included formats are Wav and Apple loops as 24 Bit audio, and all the keyboard parts also come as Midi loops which have been been performed by Steve Burton who played keys on Swingbeat tracks in the early 90's, including mixes for artists such as Babyface, Janet Jackson, Whitney Houston and Bobby Brown to name a few.